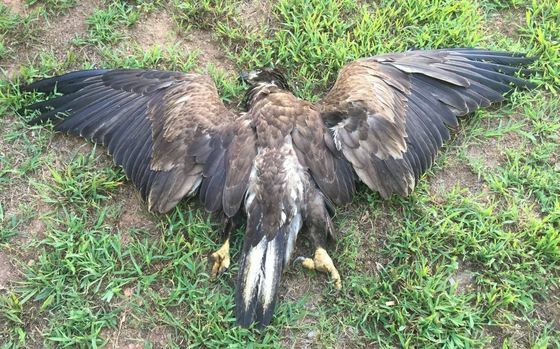 A juvenile bald eagle found dead in Banks County has DNR’s Law Enforcement Division turning to the public for help in finding the person who shot it. Rangers recently posted details on Facebook. “We’re reaching out to the public to see if somebody knows something,” said Cpl. Adam Loudermilk, who is leading the investigation. A landowner discovered the eagle in a cow pasture off Wynn Lake Road Aug. 7. Analysis at the University of Georgia determined the bird died by gunshot, likely by a single shot. Though its age is not known, the eagle is younger than 5 years old. Bald eagles reach sexual maturity and develop the distinct white head and tail at 4-5 years old. The species is protected by state and federal law. Anyone with leads should contact the Ranger Hotline, (800) 241-4113 or rangerhotline@dnr.state.ga.us. A reward is offered for information leading to an arrest. - 138 hellbenders caught, measured, PIT-tagged and sampled for chytrid fungus and ranavirus. - 25 stretches in 21 streams searched through snorkeling and flipping rocks. - 20 stretches re-surveyed as part of a three-year cycle. - Six hellbenders caught in re-surveyed streams that had been tagged in the 2012 surveys. Oh, and one hellbender caught in Alabama. The season marked the first round of surveying Georgia streams checked three years ago, said Floyd, a wildlife biologist with DNR's Nongame Conservation Section. While it’s not clear yet what the low number of twice-caught hellbenders reveals, “It’s encouraging that we were not catching the same individuals over and over again,” he said. Floyd also noted that one hellbender had moved about 45 feet from where it was first caught, and grown only about a quarter-inch. “This is a long-lived species that doesn’t grow very fast” in adulthood. The surveys are creating a dataset to assess stream conditions and population stats on the slippery sallies also called snot otters and lasagna sides. 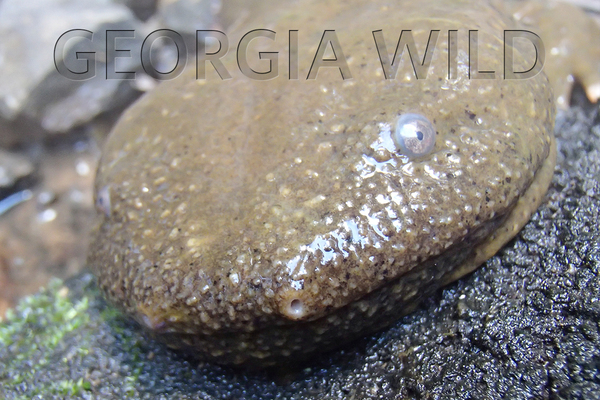 Found in Georgia in clear, cold-water streams, this cryptic species is state-protected and a candidate for federal listing under the Endangered Species Act. Because hellbenders need clean, cool water, they are bellwethers of water quality. They're also a unique part of our natural heritage. 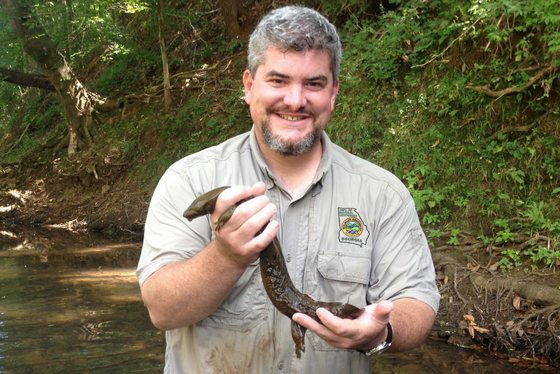 After completing the Georgia surveys, Floyd joined aquatic zoologist Jim Godwin of the Alabama Natural Heritage Program, Dr. Lesley de Souza and others in a new effort to find hellbenders in that state. The hellbender’s historical range includes the Tennessee River drainage in Alabama. But, though sightings of single hellbenders -- two of them dead -- in 1999, 2004 and 2006 have been verified, and another was spotted by a stream survey crew a year ago, no live hellbender had been collected in the state since 1979. “No one really knew whether we still had them or not,” Godwin said. That changed Sept. 18. As Alabama A&M research tech Cody Ewers lifted a large rock on the Flint River near Huntsville, Floyd nabbed a large hellbender hiding underneath. Other positives: Some streams had good habitat, and water samples are being analyzed for hellbender DNA, a process called eDNA that can indicate if a target species is present ("DNA hunt holds promise," Nov. 29, 2013). From hellbenders to bald eagles, work to conserve Georgia's nongame species is supported primarily through fundraisers and grants. Help by purchasing or renewing an eagle or hummingbird license plate, or contributing directly to the Georgia Nongame Wildlife Conservation Fund. Learn more about how you can give wildlife a chance! In late summer and early fall, ruby-throated hummingbirds are migrating south even as orb weaver spiders and their webs are increasing in size. 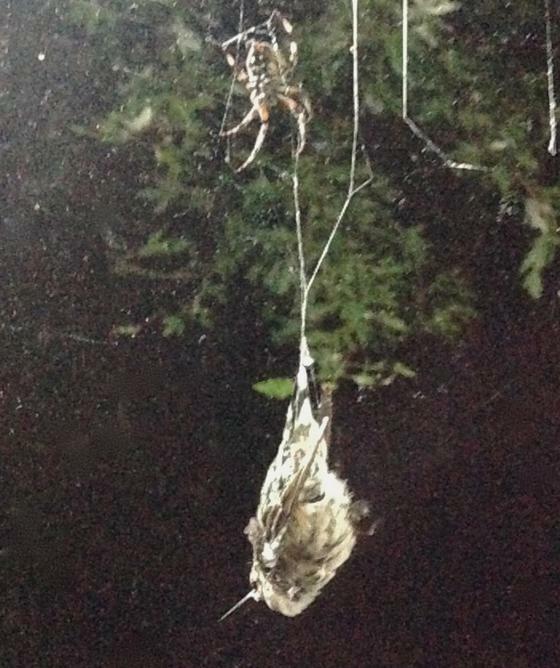 While hummers regularly eat spiders and even use spider silk to build their nests, never did I expect to see the tables turned between these two creatures! 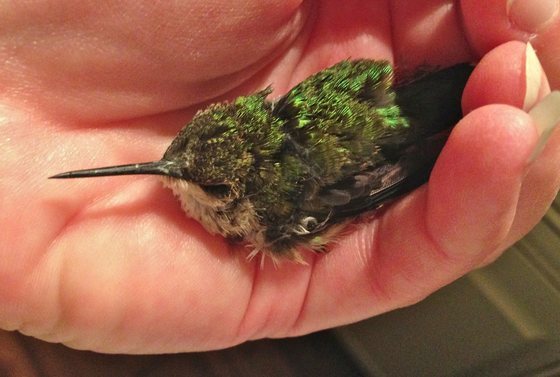 But the night of Sept. 16, my husband and I came home to find a young ruby-throated hummingbird caught and hanging upside down in the spotted orb weaver web outside our kitchen window. Read the rest of Linda's story. Also watch the video. Linda May is environmental outreach coordinator for the Nongame Conservation Section. The Berry College bald eagle and The Landings owl nest cameras are streaming again, awaiting the birds’ return. Both Berry and The Landings sport upgraded cams and setups, and both are sharing video at georgiawildlife.com. Five readers who took part in the Georgia Wild survey were picked to receive wildlife tag T-shirts, and all participants have the editor’s thanks. Survey highlights include: 88 percent of respondents have told someone about an item in the newsletter, and a quarter to nearly half bought or renewed a wildlife tag or donated via the Nongame Wildlife Conservation Fund income tax checkoff in the last year. Eagle and hummingbird license plates, combined with the income tax checkoff, made up 51 percent of revenue to the Nongame Conservation Fund in fiscal year 2015. The fund provides critical support to DNR’s Nongame Conservation Section to conserve rare animals, plants and natural habitats. How to help. Mercer the manatee wandered between Jacksonville, Fla., and Brunswick in July, according to GPS data from the project tracking manatees along the Georgia/Florida coast (“Mapping manatees,” June 18). The belt and tracking device on Lanier, another of the five tagged in June at Cumberland Island, broke and was recovered July 30, reports Sea to Shore Alliance. Bats benefit corn crops to the tune of more than $1 billion a year, according a just-published study. The two-year experiment by Southern Illinois University Carbondale estimated the payoff by assessing how bats spare corn from pests, primarily the corn earworm. The Georgia Sea Turtle Cooperative’s fall workshop, Oct. 13 at DNR Coastal Regional Headquarters in Brunswick, will wrap up the record nesting season for loggerheads and include updates on controlling Cumberland’s coyotes and ongoing marine turtle genetic research. Recent counts include 2,297 nests for loggerheads (topping the previous high of 2,292) and more than 149,000 hatchlings emerged. Whooping cranes in the class of 2015 are prepping for their first flight south. 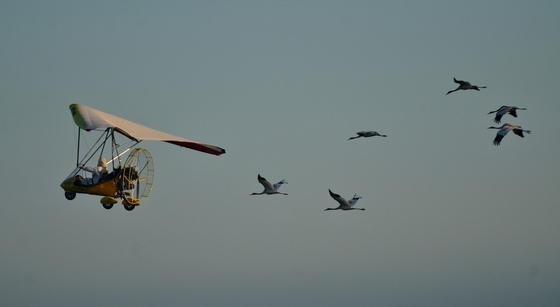 As part of the effort to re-establish a migratory population in the eastern U.S., six of the endangered birds will follow an ultralight from Wisconsin to Florida (cutting across southwest Georgia), while 14 will hopefully migrate south with adult whoopers. The Florida pine snake, a subspecies found in Georgia’s Coastal Plain and Florida, Alabama and South Carolina, will be the focus of more fact-finding after the U.S. Fish and Wildlife Service said it needs additional data to determine whether to list the snake under the Endangered Species Act. The rusty patched bumblebee, also found in Georgia, received what the agency calls a 90-day finding, as well. Names in the news: DNR Law Enforcement Division Cpl. Greg Wade of Tift County has been named North America’s top ranger, receiving the 2015 Conservation Law Enforcement Award from the Association of Fish & Wildlife Agencies. The same night, DNR Cpl. Jason Roberson, who is based on Lake Lanier, was named the National Association of State Boating Law Administrators’ Boating Officer of the Year. Gov. Nathan Deal has appointed Board of Natural Resources member Bill Jones III to the Jekyll Island Authority. The South Georgia-North Florida Fire Initiative earned the Pulaski Award, a National Interagency Fire Center honor recognizing a top wildland fire group. Bird banding at Panola Mountain State Park: 6:30 a.m. Oct. 4; 6:50 a.m. Oct. 24; 6:50 a.m. Oct. 31; 6 a.m. Nov. 14, 21; 6:30 a.m. Dec. 5, 19. Charlie Muise, Georgia Important Bird Areas coordinator. Sept. 30 – Integrated Management for the Control of Chinese Tallow (free webinar), 1-2 p.m., Southern Fire Exchange (presenter: Lauren Pile, PhD candidate, Clemson University). Registration required. - A wildlife biologist returns to Ossabaw, where he started work 50 years ago. - Terry Johnson’s column on storms vs. songbirds.